Early Monday, astronaut Steve Swanson prepares a workstation for later spacewalks. 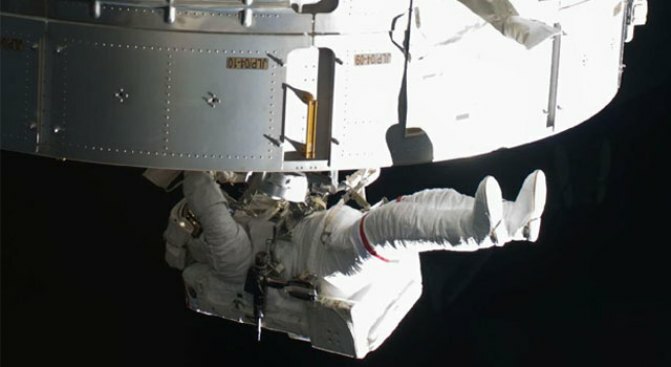 Two astronauts who were teaching math and science to middle school students just five years ago went on a spacewalk together Monday, but could not free a jammed equipment shelf no matter how hard they tried. Their path, at least, ended up clear of dangerous orbiting junk that had threatened the international space station and shuttle, and forced the joined vessels to dodge out of the way a day earlier. Astronauts Joseph Acaba and Richard Arnold II pushed and pulled the stuck equipment storage platform as hard as they could, but finally had to give up. It was unfinished business from the previous spacewalk and one of Monday's main tasks. NASA officials were not too disappointed given what Discovery's astronauts accomplished on their three spacewalks, most notably installing the final pair of solar wings for the space station. "While it is kind of bittersweet in a way, we come from a culture that is used to achieving all the things we set out to achieve, we did accomplish all of the things that were critical," said flight director Kwatsi Alibaruho. Using a hammer, Acaba and Arnold managed to loosen the pin that Acaba and another astronaut accidentally inserted upside down on the platform during Saturday's spacewalk. But the shelf mechanism just would not extend into the proper position. "Three, two, one, go," Arnold called out as they tugged with all their might. "Negative." Mission Control instructed the spacewalkers to tie the platform down using sturdy tethers. The jammed storage platform — about 5 feet (1.5 meters) square — is located on the left side of the space station framework that holds the solar wings. Similar shelving on the opposite side also needs to be extended. But Mission Control told the spacewalkers to skip it because of all the trouble with the first platform. 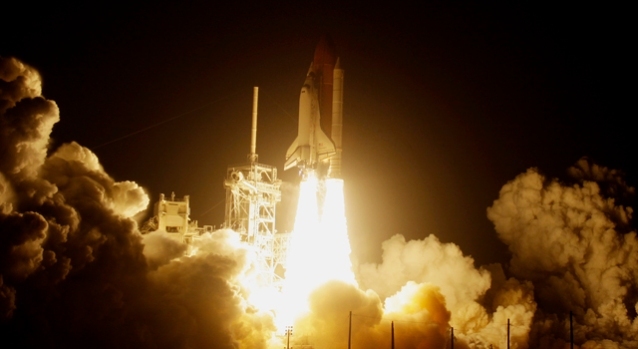 The two platforms are supposed to secure big spare parts, like gyroscopes and pumps, that will be needed once NASA's shuttles stop flying in 2010. The cargo is supposed to be delivered by another shuttle this fall. "Certainly, we can't fly that mission that's bringing up these critical spares for us until we get this problem resolved," Alibaruho told reporters Monday night. The repair work will now fall to the space station residents or the next shuttle visitors. During their 6 1/2 hours outside, the spacewalkers moved a crew and equipment cart from one end of the space station to the other, and unhooked some clamps on a hose. "You've left the space station in much better shape ... and we heartily thank you," Mission Control radioed. It was the first time two former schoolteachers took a spacewalk together, and was the third and final spacewalk for Discovery, which will depart Wednesday. It also was the second time out the hatch for both Acaba and Arnold. Their previous outings were with another astronaut, and they took pleasure in sharing this one together. Both in their 40s, they were teaching when NASA picked them as educator-astronauts in 2004. There was some excellent news, meanwhile, from inside the space station. The recycling system that's meant to turn astronauts' urine and condensation into drinking water finally completed a full cycle and yielded four or five liters to bring back for testing on the ground. As for space junk, it's becoming a growing concern for the 220-mile-high (350-kilometer-high) space station. On Sunday, the shuttle-station complex had to move out of the way of a 4-inch (10-centimeter) piece of debris that had been projected to come perilously close during the last spacewalk. Last week, the space station almost had to dodge another piece of junk. The week before, the station residents had to seek shelter in their emergency getaway capsule because of debris. On Sunday, the shuttle-station complex had to move out of the way of a 4-inch piece of debris that had been projected to come perilously close during the last spacewalk.